Everyone in this world knows about Dieting, having nutritional food, maintain physique, etc. My question will be why are we doing this? The obvious answers will be to look good, being fitness conscious, to avoid physical problem and avoid doctors, etc. To achieve that one must have strong determination and sacrifice lots of thing about which I am talking in this article. So here is a schedule for your Diet which is perfectly harmless. As you all know fried foods are diet destroyer. 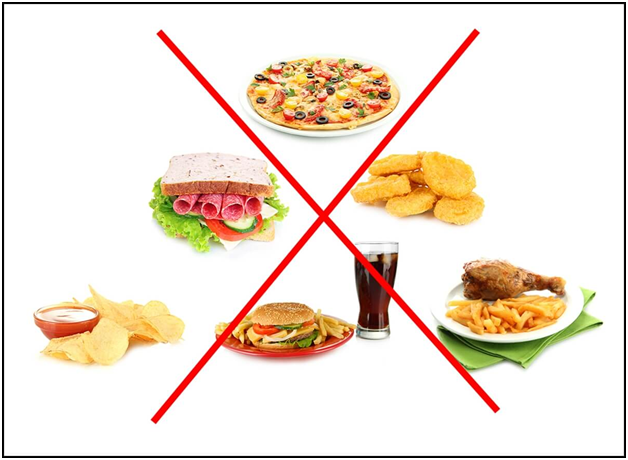 Anything fried is really BAD that destroys all calories to your food and nutrition. So, we should stop eating empty calories. Always remember any products you eat or drink have added food content or ingredients labels on packing to check how many % sugar existence in that package. 30g a day sugar is normal for any age. Is this food safe for health? Can I really eat this food? They just eat to satisfy their hunger. We only realize that his/her size is getting bigger when they go for shopping of clothes. We should be very much responsible about our body. You should add some Dairy products like milk, cheese and yogurt in your weight lose diet. Most of Dairy products are the good source of protein, vitamin B and Zinc, that helps to build strong and healthy bones. Everyone knows vegetables are best for Nutrition or Diet but no one want to eat this. Leafy Green vegetables are the great source of nutrition calorie. They are a rich huge source of minerals like calcium, potassium and iron, vitamin A, C, E and K.
This product will help you in Nutrition which contains vitamins, minerals, fiber, and antioxidants – and no fat or sodium. It can be used as an antiseptic, and is rich in highly bio-available minerals such as magnesium (which 80% of Americans are deficient in) and pectin. In USA, most of the health conscious people have black beans on the kitchen cabinets and it’s extremely affordable source of vitamins. It is very beneficial food for losing weight.